I’m a lifelong Montanan; we seal deals Western style, with a slight nod of a Stetson and a firm handshake. But after buying a co-op pied-a-terre in Manhattan recently, I wouldn’t be surprised to see a New Yorker consult with a lawyer before ordering a latte at Starbucks. 1. Don’t work with just any broker. To find an agent, walk around your prospective neighborhood, and be on the lookout for little real estate offices. These smaller offices are often your best bet to find an agent who knows the area. Step inside and ask a question or two, but resist the urge to sign up with the first broker from your very first office visit or open house. Be picky. After you’ve spoken to a few and maybe some referrals from some friends, you are ready to commit. If there are eight pictures in the online listing, and they're all of the lobby and exterior, it’s going to be bad. If the words ‘estate sale’ are in the listing, it’s bad AND dusty. Maybe it’s worth a look, but don’t wear white and for God’s sake don’t sit on that sofa. And BOY can those pictures be deceiving. 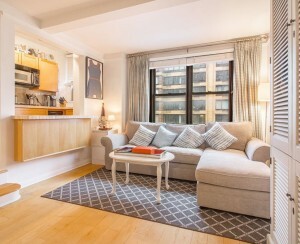 Just as photos of people often add five pounds, photos of Manhattan apartments can make them look five times larger. It’s like computer dating. When you meet up, you wish you had stayed home and washed your hair. If the photos were shot at night, you can be sure there's a reason, and you won't like it. Be even more worried if you see a closed curtain in a photograph. Curtains are the $30 fix to just about anything awful. I saw curtains covering demolished brick walls, nasty bathrooms, an airshaft so narrow my laptop would get stuck halfway down. Sometimes the curtains were strictly trompe’d’oeil: Not only was there no view, sometimes there was no window. If an apartment sounds too good to be true, it is. It might come with a ‘tenant in place’ or perhaps it is offered only to people below a specific income range. Understand the acronyms used in listings. Don’t glaze over if you see LIHTC, HPD, RFTP DK, MEIK. Decipher or die. And if you are considering a part-time residence, be sure a pied-à-terre is allowed before wasting your time. My first agent didn’t know downtown well enough to offer insight into specific buildings and co-op boards, etc. She claimed it was improper to help me come up with a number for an initial offer. The broker I wound up with, Robyn Frank-Pederson from the Corcoran Group, cocked her head at certain buildings and boards. She didn’t have to say anything. She also looked at the way our financials were structured and was not surprised about a rejection sustained while we were working with our initial real estate broker on an accepted offer for an apartment on the Upper West Side. “Look,” she explained, “the way you have your business assets listed they do not appear liquid.” Even though my numbers didn’t lie, they may have been misread. I own a business that’s unusually liquid: diamonds and precious metals. We had to prove our inventory is a highly liquid cash asset. In Montana it’s not unusual to have a home seller back a Ford F-250 pickup truck up to the door and have Uncle Jake load up the washer, dryer, fridge, stove and anything else that “ain’t nailed down.” When I asked if major appliances were included in the purchase price of one of the first places I viewed, the showing agent about busted a gut. Yes, major appliances are usually included. Despite what you see on HGTV's Selling New York, your place will not come with a game show hostess making a sweeping gesture while murmuring, “Your choice of finishes.” Instead, you will be sweeping your finger over the radiator to be sure it puts out heat. Please have your agent explain ‘maintenance’ or ‘common charges’ in advance so you don’t require oxygen in the middle of a showing. The little studio I saw on West 72nd had no lobby, no doorman, a weird entry and a basement worthy of Stephen King. The maintenance was still almost $1,000/mo. That’s silly or scary, depending on the thickness of your billfold. Beware the scaffold and the white glazed brick, because on top of normal monthly charges, special projects–like tearing off all the brick on the building and replacing it–are called assessments, something you get to take in the first three letters of that word. Co-op boards? Basically Martians with probes. I will spare you for now, just be sure all your fiscal orifices are clean and that when you do eliminate, it's green. Be brave. Camp out near the awning and don’t take more than a moment or two. Explain that you’re interested in making an offer on an apartment in their building. Ask two quick questions: What’s the best thing about living in this building? What’s the worst thing about living here? Their answers may surprise and enlighten you. One resident of a building off 96th and Central Park West told me that he couldn’t decide what was worse, the mice that overran the place or the strangers that he’d see roaming the halls. I didn’t even wait to ask him what was good about living there. I did stay long enough to thank him. 6. Think PAYMENT as well as COST. Think of this early in your search. You may be limiting your options. Obviously if you pay lower maintenance you can spend more on a mortgage. We mortgaged our Montana home to pay a 40% down payment, which reduced our monthly expenses. You may be able to afford more than you think, but you’ll have to flash your fiscal weaponry to a mortgage broker, bank and co-op board. 7. Take public transportation to the apartment. Arrive early and walk around with a mental checklist: Grocery store, gym, coffee shop, jazz club, methadone clinic, library? Walking provides a context that can’t be obtained online, and if you are new to the city, it can mean the difference between living in Chelsea (next to the railyard across the street from the tunnel) or living in Chelsea (across from a row of galleries and a health food store). If you have a demanding subway commute, please do a round trip in rush hour before you rush to sign the contract. 8. Even if you don’t plan to use it, visit the laundry room/basement. As you become more realistic, sigh and cross off ‘exposed brick’ and ’ten foot ceilings’. Remember the incredible backyard that comes with every apartment: New York City. 10. Know your way out before getting in. This sounds cynical, but it’s just the opposite. If you’re thinking you’ll trade up $100K in a few years, you might decide it’s smarter to spend more now instead of losing all that equity to resale costs. Informed agents told me to estimate about 10% in selling expenses when the time comes; if you trade up and add buying fees, you might decide to hunt bigger game at the outset. I had been looking for places under $350K, hoping to trade up in a few years. Ten percent of a selling cost of $400K is $40K, and probably 6% of buying cost of a new place in the $500K range would be $30K. That’s $70K in trading cost! We upped our ante, and as women often do, I pointed out to my bewildered husband “Look at all the money we saved!” I had to whap him upside the head after saying that just to get both his eyeballs to aim forward again. After I had an accepted offer, I thought I was home free (well, home for small fortune, anyway). I was wrong. Once you stick your finger in the gears of the buying process, you have to let them have your hand, then your arm, and before you know it, your entire body is squeezed, extruded and pummeled in a system of angled gears that hurt like hell and get even worse when you attempt to resist. It’s easy to get a mortgage loan. Just prove to a chorus of demanding strangers--in the most demeaning way possible--that you absolutely do not need a mortgage loan. All you have to do is have credit scores over 800 (check), no liabilities (check), and an ample cash reserve, maybe three or four times your loan amount. To prove you are worthy, you make a binder containing all anyone will ever need to destroy you financially. You never get these binders back, but you are assured that they are ‘destroyed’. Despite our stellar credit and savings, getting our loan was touchy. The mortgage agent courted us with a silver tongue. Once we signed up, he started screaming like a banshee. Assembling everything the bank and board required was insulting and interminable. Once you gave them what they wanted, they wanted MORE. Of course, I had to drag my husband from Montana in the dead of winter, pay for a hotel, and make him miss an NFC Playoff game and dress up in a suit to hear those words. As far as the postscript, so far, so good. 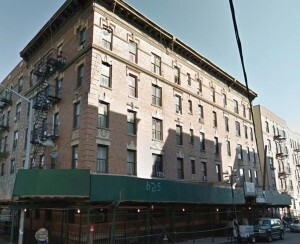 We’ve got great neighbors and our studio is in the heart of Chelsea, 18 steps to the E train. 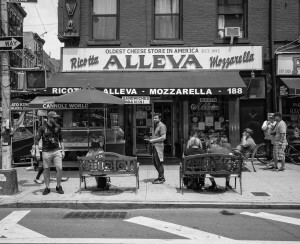 I have gone from cowgirl to subway rat and lived to tell about how the dead ends, backtracks, a few shocks and some bad advice eventually led to this sweet little bite-sized portion of the Big Apple. Claire Baiz is a freelance writer and business owner from Great Falls, Montana. She serves on the editorial sounding board of the Great Falls Tribune and blogs at wedgeblog.net, where parts of this post originally appeared. The apartment search that inspired this post was recently featured in the NY Times' column "The Hunt." 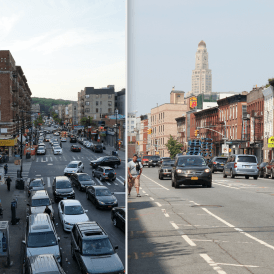 What happens when your NYC neighborhood gets rezoned?